Undefeated boxer Floyd Mayweather has been ranked the eighth most dominant athlete of the past 20 years by ESPN the Magazine. The 41-year-old retired for the third time last year after reaching 50-0 in a multi-million dollar showdown against MMA star and novice boxer Conor McGregor. The only other boxer to make the list was the Grand Rapids, Michigan native’s archrival Manny Pacquiao who came in 11 spot below Mayweather at number 19. Golfer Tiger Woods claimed the number one spot on the list, which was released on Tuesday. Also ahead of Mayweather were basketballer LeBron James at number two, NFL’s Peyton Manning at number three, NASCAR driver Jimmie Johnson at number four, tennis player Roger Federer at number five, golfer Annika Sorenstam at number six and Formula One driver Michael Schumacher at number seven. Co-hosts of ESPN’s “First Take” program Stephen A. Smith and Max Kellerman disagreed on the rankings with Smith arguing that Mayweather deserved to be at number three behind only Serena Williams and Woods, while Kellerman thought there was a notable omission from the list. 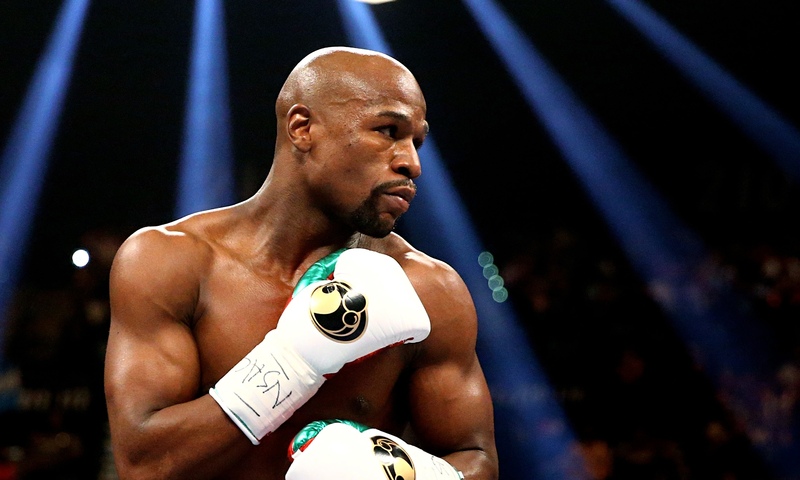 “Number three on the list – Max Kellerman, you’ll appreciate this – Floyd ‘Money’ Mayweather,” said Smith. “[He’s] 50-0, even though I consider him 49-0 because I didn’t consider Conor McGregor a boxing match. I’m sorry. But 49-0, you wanna call it 50-0. But taking control of his own career, running his own show and generating in excess of a billion dollars for himself along the way, I mean, that’s just pure business brilliance. Former ESPN boxing analyst Kellerman, now with HBO, took umbrage at the exclusion of former middleweight, super middleweight, light heavyweight and heavyweight world champion Roy Jones Jr. The list will be debated on an ESPN special called “Dominant 20” that will air on Thursday night at 9PM ET.